Food transporters are the best ways to take your culinary creations off site. Insulated transporters are the recommended option for small events, and will fit 4 food pans to 7 sheet pans. These will keep you food hot or cold for up to 6 hrs. We have insulated and non insulated heating cabinets for larger events. These units will hold 11 full size sheet pans or 22 full size 8-quart food pans. Utilizing a standard electrical outlet, the cabinet will reach a max temperature of 220 degrees. Both units are on casters for easy maneuverability. Once unplugged our insulated cabinet will keep your food hot for up to 4 hours, ready to serve your guests at a moments notice. We also offer smaller warming units for your indoor event where a heating cabinet is not necessary. The Alto Sham and Cook & Hold are perfect for this application. Also utilizing a standard electrical outlet, these units will hold food at a temperature of up to 200 degrees.The Cook & Hold unit can be programmed to cook items requiring low temperatures and then hold the item for the desired amount of time needed. 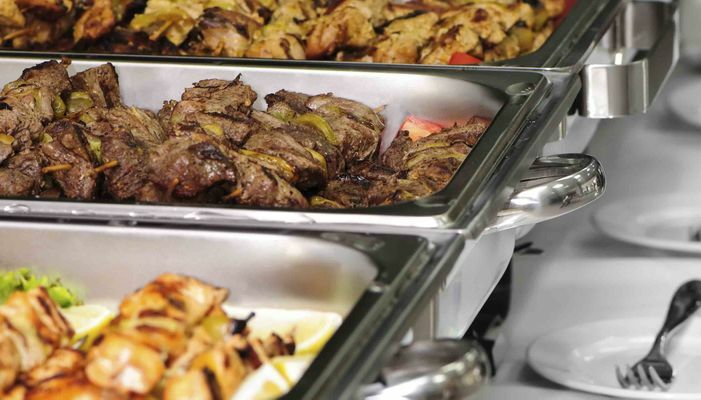 The most commonly rented item on the buffet line is our chafers. We have options in stainless steel and silver, with varying sizes and shapes. Utilizing sterno canisters for temporary heat. Cooking on a large scale requires special equipment to insure the job gets done on time. We offer a 6 burner stove/oven, which has a max temperature of 500 degrees. We also offer convection ovens. Our table top model is perfect for those indoor events. The larger convection oven is perfect for cooking large amounts of food, with a cooking range of 90 degrees to 500, powered by electricity and propane. Stoves and ovens that use propane are required to be used outdoors. We offer single and double burner stoves. These are exceptional for lobster bakes, broils, and cookouts. These propane gas fed units, range from 2,000 to 60,000 btu and can take cook large amounts of food when properly prepared and combined. Events needing only a small cooking surface, our butane cassette stoves and inductions burners will suit just fine. Our cassette stoves are portable and can be used in any location; indoors or outside. The induction burner works with special magnetic pans. This unit will only work with these special pans, but we carry a stock pot and also a saute pan. This special safety feature is a bonus an sought after feature of high traffic areas. Have further questions? Contact our event consultants Monday through Saturday 8am - 5pm, or visit our showroom see the equipment in person and make your own selections.